A sympathetic and sometimes necessarily speculative biography of the Haitian leader whose military and political acumen made possible the independence of his country—although he died in a French prison before the official declaration on Jan. 1, 1804. Bell (English/Goucher Coll. ; The Stone That the Builder Refused, 2004, etc.) artfully and gracefully assembles the wispy, elusive threads of Toussaint’s tale. He begins with background about Columbus’ arrival on the island he called Hispaniola and proceeds with a brief analysis of the importing of African slaves to work on the sugar plantations. Bell notes that we know little about Toussaint’s early years (spent on a plantation, where he worked with horses), but by the time the revolution exploded in 1791, he’d been free for about 15 years and had owned slaves himself. 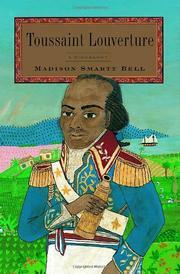 Bell astutely follows the complicated geo-politics involved in the revolution. England, France, Spain, the United States—all had an interest in the region; all, at one time or another, had land and/or naval forces near or on the island. And to varying extents, Toussaint allied himself with all of them, though he always, Bell persuasively argues, sought the abolition of slavery. Toussaint emerges as both accommodating (he endeavored to keep the plantation system—though with paid laborers) and sanguinary (he did not hesitate to order executions). Bell highlights the many parallels between the careers and capabilities of Napoleon and Toussaint; he shows how foreign military involvement can result in tragedy for all; he comments intelligently on the relationships between Voodoo and Catholicism. An informed correction to biographies that have demonized or lionized Toussaint. Note: Bell’s documentation is erratic; sometimes he identifies his sources, sometimes he doesn’t.